Poncho Hernández was born in Mexico City in 1984. His passion for culinary art is the reason why he decided to be a professional chef in the first place. 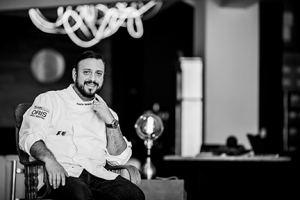 Currently, he is working as the Executive Chef in Sal de Nayar Studio, he is "Ambassador for the Swiss watch brand ORIS", and a consultant chef for several leading gastronomic projects in the market as food, exhibitions, restaurants and kitchen equipment. His entrepreneurial spirit led him to work on several gastronomical projects from a very young age. His first business was based on the Breakfast segment and later on, due to an unexpected success, he started a salad business. Little by little Poncho acquired experience and was able to start a catering business called Gommetería Punto MX, a company that, after a few years, merged with the Hedonia Polanco Restaurant. Poncho has been working as a consultant for Herdez and restaurants such as Prego, Gaucho Grill, Chabela, Posada Catrina, the Ministry of Tourism of Querétaro City and Man Industries. During his career in the food industry, he has been working as International Concierge Manager in Axa Assistance Mexico, Chef at the Jockey Club Hipódromo Restaurant, Chef de Partie at NH Hotel, Executive Chef at Lola Interlomas restaurant and Rufino Tamayo Museum in Mexico City, obtaining the "Best Museum Restaurant" recognition in Latin America according to Maxwell magazine. Chef Hernández is part of the Vatel Club Mexico, the most important Culinary Association in Mexico, in such a way that he has participated as a judge for national and international contests. Recognized by Quien magazine among the 50 people who are changing the country in 2017. • National Champion of the INTERNATIONAL CATERING CUP and representative of the Mexican national team in Lyon, France in SIRHA. • "First place" in recognition AMBAR, contest organized by the National Chamber of Beer and Malta. • Entered the list of "THE NEW TOP 8 CHEFS OF MEXICO 2015" Ranking developed by the Robb Report.